I am always on the lookout for additional science resources, especially for the upper grades. 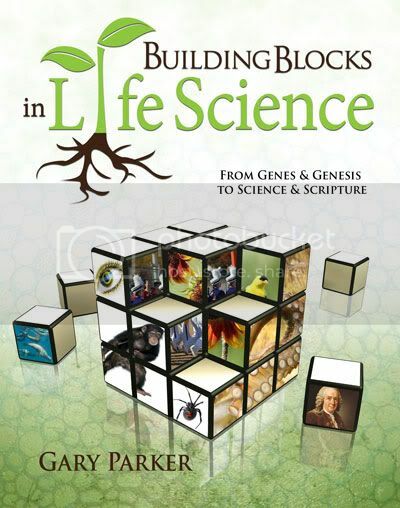 I was thrilled to get the chance to review Building Blocks in Life Science by Gary Parker, because the plan has been for Connor to be taking biology 2 after he finishes up Chemistry this month. I have heard of -- but never actually seen -- his previous book, Building Blocks in Science. It has always sounded interesting, but it just hadn't made my "must have" list. Teachers and students will find clear biological answers proving science and Scripture fit together to honor the Creator. This dynamic educational resource helps young people not only learn science from a biblical perspective, but also helps them know how to defend their faith in the process. Author Gary Parker is a former evolutionist. He has an Ed.D in biology, and has lectured widely for both the Institute for Creation Research and Answers in Genesis. Currently, Gary continues to lecture, conduct science labs, and field trips for young people. I love it. And this book will be required reading for my high school biology students. Unit 1 (8 chapters) focuses mostly on genetics, which is something I've always loved. One of my very favorite classes at the University of Minnesota was an honors course in genetics. I have really great memories of the research topic my small group was assigned, which had to do with genetic engineering and biological warfare. The point is, this is an area where I have at least some knowledge, and definitely a lot of interest. And I found this entire section incredibly well-written, and very detailed without being overwhelming. It is definitely at a level meant for high school or older though.